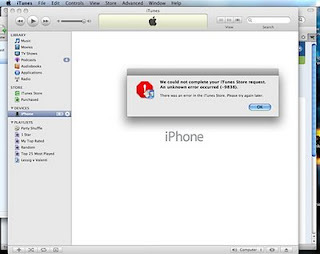 As of 10:20 a.m. today E.T., The iTunes Store is down for iPhone activations. Here are the error messages you receive using the Mac and Windows. There servers are no doubt over loaded because of all the users trying to upgrade to iPhone 2.0. I'm sure some are having problems installing this upgrade which will make their phone unsable if they can't restore. At least when you buy a microsoft product you go into it knowing you'll be screwed over.... Apple just seems to find ways to do it "undercover".. I checked for update with my iphone and was told that 2.0 was available... I clicked 'download and install' and it downloading, did a whole load of backing up stuff etc.. and then eventually just stopped with this error. The phone now shows a graphic of plugging the USB cable into iTunes, and a 'slide for emergency'. Nothing else works. When I connect it back to iTunes, it again shows the above error. I hope when the Apple systems are ok, it will be able to install the update and become usable again! When they came out and said, "3 16gig black iPhones remaining," and I was 15 from the door (I had started at 40th) I left. 30-odd phones for a store? Are you kidding me? Is Steve hand-assembling them?